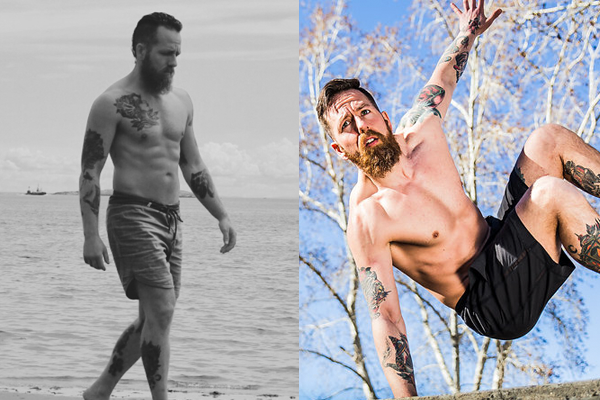 What’s your single best training tip for improving balance? Balance for the human animal is made possible by a complex network of sensory organs and systems that map out the entire body. In order to navigate through space in the physical landscape and maintain balance we must process a slew of information, organize and then integrate it. This is achieved through the blending of input from our eyes, proprioception (sensing where our joints are in space), and the vestibular system (inner ear mechanism that senses motion, spatial awareness, and equilibrium). It’s really interesting and important to understand the intimate relationship between vision and vestibular function. As we first started navigating our world it was our vestibular system that guided our movement. It is the only fully intact, functioning, and myelinated (read faster nerve impulses) system that we are born with. Our visual system was still developing which means that vestibular function was on first call to direct our movement, which in our early years helped direct the visual system. So, as a baby, our movement guided vision. But as we age and our vision improves, we become more reliant on our eyes to guide movement. The general consensus is that visual processing requires a half to two-thirds of the brain, which means, when our eyes are open, a majority of electrical brain activity is devoted directly to it. As our vision improves we become highly dependent on it and it can even begin to override our other senses. So, what happens if we flip off the switch? We know that if robbed of a sense, other centers of the body will compensate in an attempt to make up some of the difference. This neuroplasticity allows for the development of new information pathways which elicit varying degrees of performance enhancement. Think of it as a steroid for your balance. By shutting down the signals to the visual system, both your vestibular and proprioceptive senses are forced to work overtime to ensure your safety and ability to function. This will create an enhancement in proprioceptive awareness as well as a subtle uptick in vestibular sensitivity. It’s a simple yet potent layer of complexity that gives a huge payback in all aspects of movement. Optimal balance is a cornerstone of efficiency. 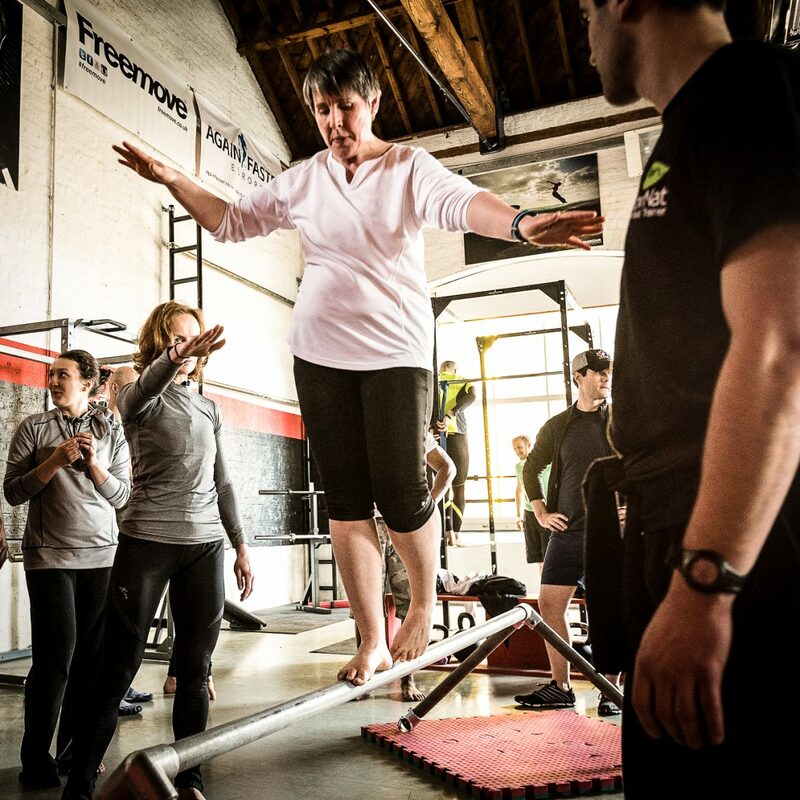 As a MovNat practitioner once you’ve developed a decent amount of consistency with balance walking and reversing drills then you are ready to begin doing so with your eyes closed. Continue on with your progressions to more complex movements like the tripod transition but doing so with your eyes shut. Any time you begin to lose balance just open your eyes, take a breath, re-orient yourself, and start again. Or, to include it into your lifestyle practice, simply close your eyes and stand on one foot the next time you find yourself with a stationary task for a minute or two. Say, like brushing your teeth. My number one recommendation is, of course, to strip the movement down to the basics and use principles of Developmental Progression (i.e., working “From the Ground Up”). Erwan had a tip that was very useful for me. He used the power of visualization to help my balancing performance. He told me to imagine I am much higher than I am when balancing at low heights and imagine I am at ground level when balancing at high heights. 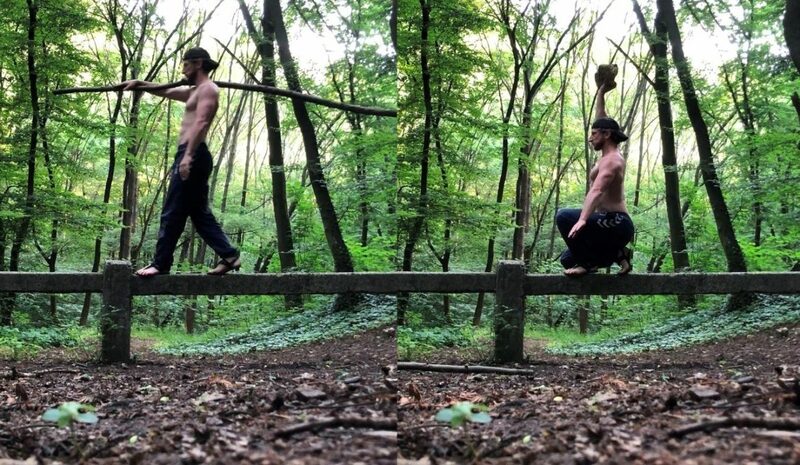 This reverse visualization has helped me train better when I’m practicing on 2x4s at ground level and perform better when balancing at height in more visually scary or unfamiliar real world circumstances. 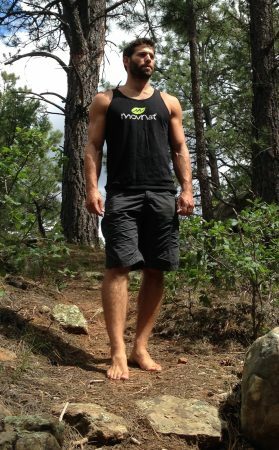 Following my “Movement snack” philosophy, and to help as many people stuck within the daily effects of a sedentary 9-to-5 business lifestyle, I usually focus on mornings and evenings when it comes to balancing and always try to find a good spot to practice basics such as walking forward/backward as well as shuffling or reverses (including weights). Why mornings? Because I’m usually foggy when I wake up, or maybe sore from a hard movement session the evening before. A simple early morning long walk in the woods followed by balancing drills make my mind sharp, refreshed and simply makes me smile, feeling in tune with myself again. Why evenings? Because after hours spent on calls, looking at my laptop, sitting down in meetings, I realized that my equilibrium has often been altered. My first attempts to balance on a narrow surface usually feels very weird. But rapidly, balance comes back and the same goes with my smile. I would also add a little challenge on my way to and from lunch, as a very narrow curb is along the path. I always make myself walk on it and do my best not to step off once. The satisfaction from all those little moments create the feeling of being in control of my day – owning it. All we need to do is open our eyes and seek opportunities as plenty of them just stare at us! This is my form of meditation. Ready to Deepen Your Natural Movement Practice? 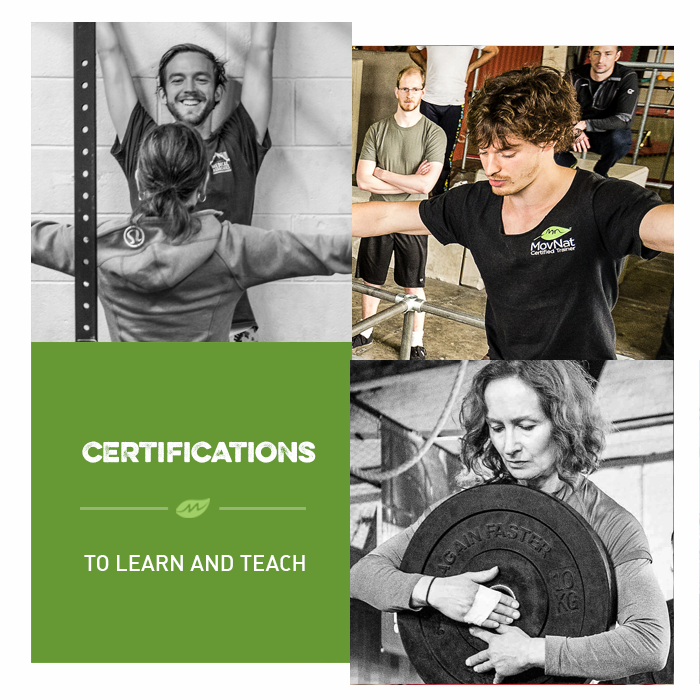 If you’d like to learn more about Natural Movement Fitness to deepen your movement practice, join us for a MovNat Level 1 Certification or a MovNat Workshop. We hold events all around the world. Or, find a MovNat Certified Trainer or Gym in your area. We also offer MovNat Online Coaching as an alternative to live instruction.